Home / News / BLACK FRIDAY WEEKEND SALE – 20% off select Star Wars & More! BLACK FRIDAY WEEKEND SALE – 20% off select Star Wars & More! THIS WEEKEND ONLY! CELEBRATE BLACK FRIDAY, SMALL BUSINESS SATURDAY and CYBER MONDAY! Enjoy 20% off select Star Wars™ with the coupon code HOLIDAY18! Take advantage of this special offer through Monday, 11/26/18 at 11:59 PM PT! Now’s the time grab cool gifts to help the Star Wars fan in your life bring a little bit of geek decor style into their home, office or fan cave! Note we have limited stock and some made-to-order items will ship after the holidays. Check our Holiday Shipping Schedule to see when the items you’re ordering will ship! This weekend only! Save on Mandalorian decor with our BLACK FRIDAY SALE! This weekend only, you can save on the entire line of our MANDALORIAN SKULL sculpture and decor creations, including our most popular item, the Mandalorian Skull Mini Sculpture, our Limited Edition Pewter Mandalorian Skull Sculpture, the Acrylic Display Stand (pairs with both the mini or pewter skulls) our Mandalorian Skull Plaque relief sculpture and even the largest version, the Mandalorian Skull Wall Decor. Each of these beautifully crafted items are products in the USA, hand painted and detailed by our artists and are based on hand sculpted masters created by talented FX professionals! Save on select Star Wars themed furniture this weekend with code Holiday18! 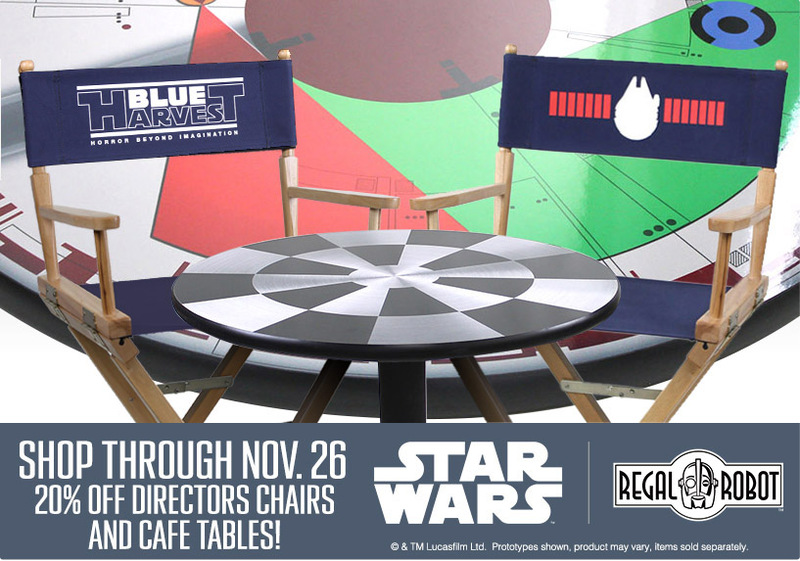 Also included in this offer are our entire line of Star Wars director chairs and cafe tables. Bring a galaxy far, far away into your home and choose your style from a wide range of themed designs for Rebels, Imperials, Smugglers, Mandalorians and behind the scenes film fans alike! Choose from classic film logos and movie code-names, and great art inspired by the Millennium Falcon™, the Death Star, the Rebel Base and more! Note – Director chairs will ship right away, however, the cafe tables require a longer lead time and will likely ship after Christmas. Wow! Save 20% on all orders for our Emperor Throne inspired chair and bring your living room to the dark side! You can also take a huge 20% savings on our Emperor’s Throne Inspired Armchair. Embrace your dark side and save 20% this weekend on this plush, comfy, living room chair from Regal Robot’s Custom Studio! Inspired by Emperor Palpatine’s throne, this streamlined, modern armchair swivels on a polished chrome base. Two-tone faux leather in black and rich purple reflect the colors of the original seat of power seen in the film. Make your home, office or fan cave feel like the Emperor’s throne room in Star Wars: Return of the Jedi™! Note – this item is made to order and will ship after Christmas. All Black Friday weekend, save on classic, Ben Cooper style monster decor! ALSO ON SALE THIS WEEKEND! Use the same code, HOLIDAY18 for a MONSTER 20% discount on all of the original, limited edition Ghoulsville Wall Decor masks from Retroagogo, including the new licensed MONSTER CEREALS MASKS which just debuted this Fall! Each is a limited edition so this only applies to in-stock items. Once they’re sold, the style is retired so shop now in our More Decor section and use the coupon to save today! NOTE – this sale requires the coupon code HOLIDAY18. Coupon only applies to select items and does not apply to shipping costs, custom studio commissions or concept art. Please see our site’s Payment, Shipping and Returns page for further details about coupon and discounts. And, while we may have big ideas and big creations, we’re still a small, online business! We’re keeping our sale going through the weekend to celebrate Small Business Saturday and Cyber Monday. Please do your part to shop local and support small businesses like ours! Thank you all for reading and we hope you have a great Thanksgiving and kickoff to your holiday season! All the best to you and yours from the artists of Regal Robot!